Rand's second major novel, although a deeply flawed book, nevertheless is a work of genius and contains some of her most powerful writing. Although I would contend that We the Living is a better all-round novel (more realistic, containing less flaws), The Fountainhead is more ambitious and reaches greater heights (as well as much greater lows). Regardless of the flaws of The Fountainhead, I would not hesitate to rank it above the over-written and preposterous Atlas Shrugged. While both novels suffer from more than a fair share of unrealistic characters, situations, and eccentric, often counter-intuitive, if not perverse, analysis of the human condition, The Fountainhead at least makes an attempt to engage the reader's sympathies. 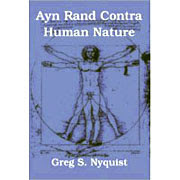 Rand had not yet formulated her Objectivist philosophy when she wrote the novel, and she does not attempt to place everything within the strict confines of an ideological straight jacket. In The Fountainhead, she gives free rein to her imagination. And while this doesn't always work out for the best, at least it provides a source of entertainment. In this post, I will give a quick glance to the good, the bad, and the ugly of Rand's second major novel.